This popular maharashtrian snack is easy to make provided you have the basic flour ready. Out here in Mumbai or most of Maharashtra and nearby places, it is easier to find the popular bhajani (roasted flour mixture) to make thalipeeth. Literally translating this means, Dish dough(thali –peeth). It is so named because I think it is spread with hands on a dish and then roasted on a griddle. 1) Make a soft pliable batter mixing all ingredients except the oil. 2) On a flat surface, place a plastic sheet and wet it using some water. 3) Now make a ball using the dough and start flattening it on the plastic sheet to form a round roti. This is a thalipeeth. 4) Heat a griddle/ tawa and put I tspn oil and let it heat. 5) Now punch some holes in the rolled out thalipeeth and gently transfer it from the sheet to the griddle. 6) Let it cook well on one side. Drop some oil in the punctured holes. Now flip it around and let it cook on the other side. I make it very similar to yours too , Pradnya - may be the city has rubbed it off on me :-) Lovely to do the BM with u ! Hope to catch up with u in the city one of these day ! 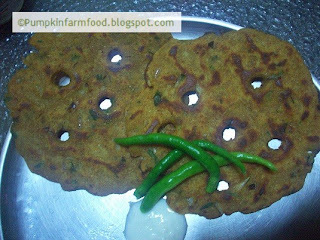 Looks marvellous, love thalipeeth with some pickle.. I should buy the bhajani flour soon. Delicious thalipeeth. My kids love this kind of roti with curd!! New to me. Looks yummy. Will try sometime. Something new and looks nice. I love these breads..and the holes make them look cute!